There is something very attractive about windmills and they appear to generate more interest than watermills. 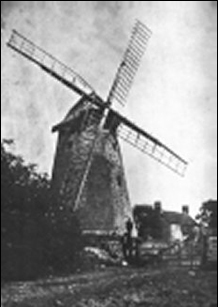 Bradwell Windmill still stands after two centuries but it was only used for 71 years of its life as a working mill, closing in 1876. I have reproduced the text below of a duplicated sheet produced by the Council. It is dated 1956 and someone in my family paid 3d for it. One curiosity is the last paragraph: No responsibility can be accepted by the Council for any accident, injury, or loss sustained by any person while in, or in the precincts of, the windmill. Obviously this disclaimer was sufficient in 1956 to protect the Council from lawsuits. The Windmill is built of stone and dates back to the late 17th or early 18th century. It is the oldest tower mill in Buckinghamshire and is included in the list of buildings of special architectural or historic interest which has been compiled under S. 30 of the Town and Country Planning Act, 1947. The Mill is old enough to be of interest both on account of its design, and as an example of how grain was milled in bygone days. When in use the Mill was driven, by four sails with a span of about 52 feet, on which there were sailcloth “curtains” that the miller could draw across at will. As reconstructed the sails are shortened to reduce their weight. means of gearing and the wheel and chain still to be seen. The mill has two main floors above the ground, The first floor carried two sets of grindstones, one for wheat and the other for barley; a flour dresser consisting of a drum of perforated metal in which long brushes revolved; and the main vertical driving shaft from the sails. An interesting feature was the governor arrangements which increased the pressure on the millstones as the speed of the sails quickened, and acted conversely when the wind dropped. The millstones have been lowered to the ground floor for safety, but parts of the flour dresser and governors can still be soon. The second floor was the garner, which contained most of the hoisting gear and the hoppers from which the grain was fed down through shutes to the centres of the millstones below, the flour then emerging from the periphery of the stones. An extra section of floor has boon laid at the top of the mill to give access to the huge brake wheel, sail shaft, and other gearing and mechanism. When in 1949 the mill was acquired by the Council the roof had collapsed, the sails were beyond repair and the interior was in decay. Gradually the mill has been restored by pointing the tower; building a now roof of traditional design; reconstructing the sails; and repairing the mechanism, floors, timbers and ladders. The cost of acquiring the mill was £80 and that of restoring it, £1,910. Towards the latter, a sum of £500 was contributed by The Pilgrim Trust and £558 by the Bucks County Council and £180 came from other outside sources; leaving an amount of £752 which was met locally. The Council appeals to visitors to respect the property which is maintained at public expense. No responsibility can be accepted by the Council for any accident, injury, or loss sustained by any person while in, or in the precincts of, the windmill. Council Offices, Market Square, Stony Stratford, Wolverton, Bucks. The mill was built by Samuel Holman in 1805 and operated by him until his death in 1825. Thereafter it was run by his widow and son. It was probably sold after this and the millers thereafter appear to be tenants. In the 1841census William Carr is the miller. He appears to come from the long standing family of millers at Haversham Mill, sometimes known as Carr’s Mill. He iis recorded here with his wife Frances, both with given ages of 50. They have two sons, John, aged 14 and William 12. They also employ a 20 year old William Lambert to assist with the working of the mill. A few years later they moved to Castlethorpe Mill, where they are recorded for the next two censuses. 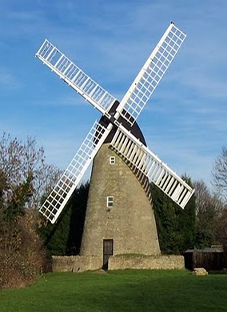 I don’t know much about mills, but I would imagine that a watermill (as Castlethorpe Mill was) would have been more productive than a windmill, due to a constant source of power. The miller in 1851 was George James, born in Bradwell 33 years earlier. He has with him a 24 year old wife Mary and their 1 year old son Edwin. They employ a 13 year old female domestic servant Harriet Morris and John Colley, a 20 year old miller’s assistant. But by the next census he has changed his trade to that of carpenter and the mill is in the hands of William James, 55, possibly an older brother. The 1871 miller was Robert Saxby from Kent. He was 50 and with quite a large brood with him. There are 9 children ranging from 22 to 1. Saxby was certainly a career miller. Starting in Kent, he moved to Weston underwood for a few years prior to his move to Bradwell. After 1876 he moved with his large family to the Eling Tide Mill in Hampshire. In 1881 it is occupied as a residence but not as a working mill. The turnover would suggest that this was not an economic mill, except perhaps in its early days. It was pretty much derelict for the first half of the 20th Century. As can be seen from the above document, the Council acquired it for a mere £80 in 1949, which was possibly all it was worth.